Okay, so these are technically gifts I would love to receive. But I’m sure that there is at least one lady in your life who wouldn’t mind getting one of these for Christmas. And every item is UNDER $20.00. See? I’m looking out for you and your wallet. 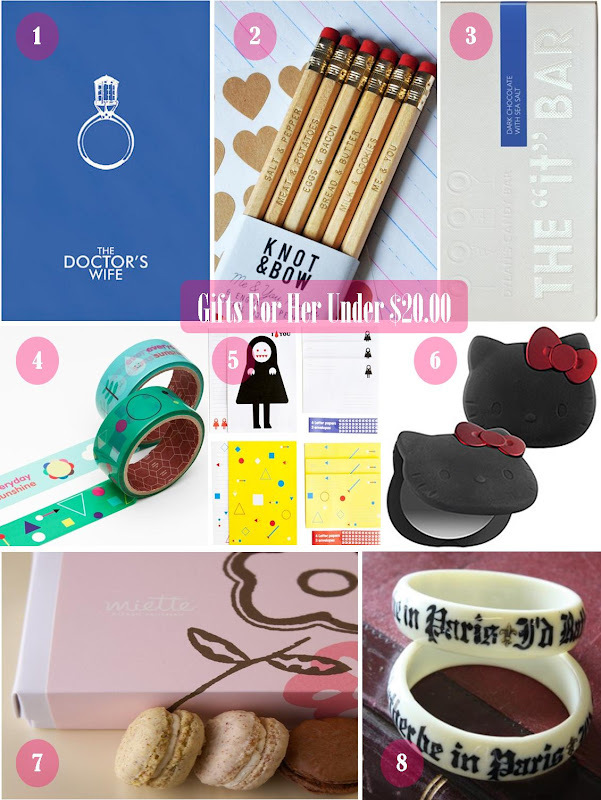 This entry was posted in Ab Fab Friday, Geekin' Out and tagged Doctor Who, Dylan's Candy Bar, etsy, French Freak, Hello Kitty, Knot & Bow, Miette, Modern Stylographer, Poketo, Sephora. Bookmark the permalink. I like this post with gifts under $20…question, how did you post these photos side by side?